We are down to the Sweet 16, and with the lack of upsets we pretty much have every contender still left in this tourney. Oregon is the biggest dark horse and they come out of the Pac-12 which certainly doesn’t look at themselves as a lower conference despite the miserable year they had. We have every 1, 2, and 3 seed still alive and that should make for really competitive games down the stretch. The article is going to breakdown each Sweet 16 matchup from both a betting and DFS perspective. With only 4 games on the schedule we won’t have any many options to choose from and puts a premium on making sure we don’t overlook any of the value situations on this slate. First game tips off at 7:09 EST out in Anaheim so I expect the Zags fans to be out supporting their team. They had a minor test from Baylor, but at no point looked in real trouble and now get this Florida State team who showed what they are in the first 2 games. On Thursday they looked vulnerable to Vermont, and then on Saturday they absolutely dismantled Murray St and that’s the gigantic range of outcomes we see with this deep, long, and talented bunch. Kabengele sits at 5.9k on DK which is definitely a price that makes him one of the better options on this smaller slate. He comes off the bench, but still is one of the Noles go to players down the stretch despite this deep rotation. The question with him is always how many minutes you are going to get from him, but in a game where they are sizable underdogs I would hope he gets a bump. Forrest is one of the Noles whose minutes are a little more secure, but he still doesn’t have the highest ceiling and to me is more of a high floor lower variance type play. The Zags are obviously a super talented bunch themselves and Brandon Clarke’s showing against Baylor was a statement game with 36 points, 8 boards, 5 blocks, and a few steals/assists. He is priced up and the length of Florida St is going to cause some problems so to me its more of an options if you have the money left rather than a starting point. I lean to Florida St +7.5 here as I think these teams are pretty evenly matched despite the difference in seeds. FSU has seen plenty of top end teams thanks to the ACC having the other 3 #1 seeds so this isn’t going to be a situation that they haven’t been in this year. The key for them is can they find some consistency on offense and get a few guys to get going from 3 which makes them super dangerous to defend. The depth is a double edge sword as I think they should shorten the rotation a bit, but I think this game stays close throughout with a chance for the underdog to pull off the upset. The 2nd early game tips around 7:30 from Louisville and as the spread shows this is expected to stay close. Purdue comes in off a big win against the defending champs where they overwhelmed Villanova from the start and cruised to the win. Tennessee somehow dominated Iowa for 20 minutes and then got dominated by Iowa for the second twenty, and found themselves in the first OT game of the tournament. I turned the game off when Tennessee was up 20ish and could not believe they let Iowa claw back in and make that a game. Purdue is led by Carson Edwards and unlike some of these other teams his situation is pretty easy to breakdown. Regardless of game script he is going to be on the court for basically the entire game and is going to be shooting early and often. 15+ shots feels like a mortal lock and if they fall behind I wouldn’t be shocked if he takes mid 20’s tonight attempting to bring them back. Of course Tennessee is going to throw a bunch of different looks at him and try to keep him off the FT line which is the best way to try and slow him. Haarns at 6.4k is somewhat appealing on the inside as the 7 footer is matchup nightmare for anyone, but the key is him making sure he stays out of foul trouble with all the Tennessee bigs attacking him. Tennessee is another team with a lot of balance to it and that makes it difficult to tell who is going to have a big game. Against Iowa, Admiral Schofield, who is one of their best players, didn’t even make an appearance in OT as they had another lineup they were comfortable with and that just shows the options they have. LaMonte Turner at 5.8k is a nice option as his minutes are pretty much locked into ~35 and he contributes in a lot of different ways which helps to raise that floor and not force him to score the ball in order to meet value. This is the nightcap out in Anaheim and man what a game it should be. These are arguably the 2 best defensive teams in the country and points will be at a premium in this one. Texas Tech ended Buffalo’s cinderella story before it could get started while Michigan was in control the entire 2nd half against Florida setting up this fantastic matchup. Jarrett Culver leads TT and he is one of the better players in the entire country, so Michigan will have their hands full trying to slow him. He fills up the stats sheet across the board and is live for 5+ steals anytime he takes the court just showing why this defense is regarded as maybe the best out there. You are paying a premium for him and the games total is low, so for him to hit value you are going to need a balanced stat sheet with some blocks and steals. On the Michigan side Charles Matthews would be my favorite DFS target at 5.5k which gives him plenty of room to meet value despite the brutal matchup. Matthews has been hitting the glass hard so far in the tourney and he needs to continue to do that if Michigan wants to advance. This is a very tough game as these teams are well coached, and as I mentioned just so tough to breakdown defensively. 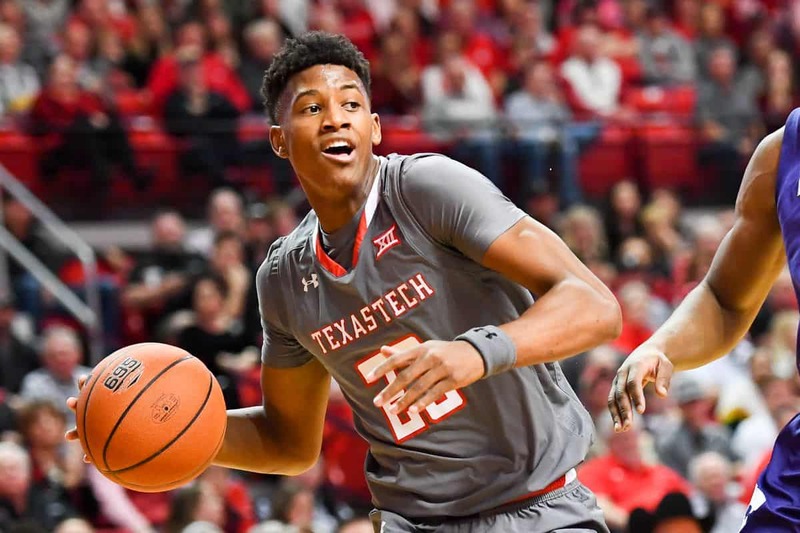 If either team gets an unexpected boost from a few role players that could make the difference in this one, but I lean to Texas Tech as I think Culver being the best player on the court if this game is tight down the stretch will pay dividends. Last game of the night from Louisville and don’t expect too many fireworks as the total sits at 119.5 thanks to Virginia’s ability to shut down teams defensively. They aren’t the extreme defensive squad we usually see, but still are in the conversation for top defenses in the country which makes it a tough game to attack in DFS. Oregon is kind of a mystery in my mind, not sure how good they are and we will quickly find out tonight against a Virginia team I really like. On the flip side, Virginia hasn’t faced any serious competition so far and draws arguably the easiest of the teams remaining with the 12th seeded ducks. They should grind them down and let De’Andre Hunter do the heavy lifting on offense when needed. Virginia is balanced, experienced, and the better team so I think they have relatively no trouble marching on to the Elite Eight tonight.